The MSD Race Tailored 8.5mm Super Conductor Wire Sets equipped with high temp silicone-fiberglass sleeving and designed specifically to fit race engines with under exhaust wires with HEI ends. The MSD 8.5mm Super Conductor is the ultimate performance wire! Its extremely low-resistance combined with the ability to suppress Electro Magnetic Interference is a combination that defies the common laws of physics. Less resistance means more energy is going to make it to the spark plug to ignite the air/fuel mixture. The Super Conductor uses a copper alloy conductor resulting in less than 50 ohms per foot of wire! This ensures that the most energy possible makes it to the spark plug. By helically winding the conductor around a special core, we are able to produce a highly effective choke to keep the EMI inside the wire and away from other electronics. This combination is encased in a heavy duty sleeve that will withstand abrasion and high temperatures. 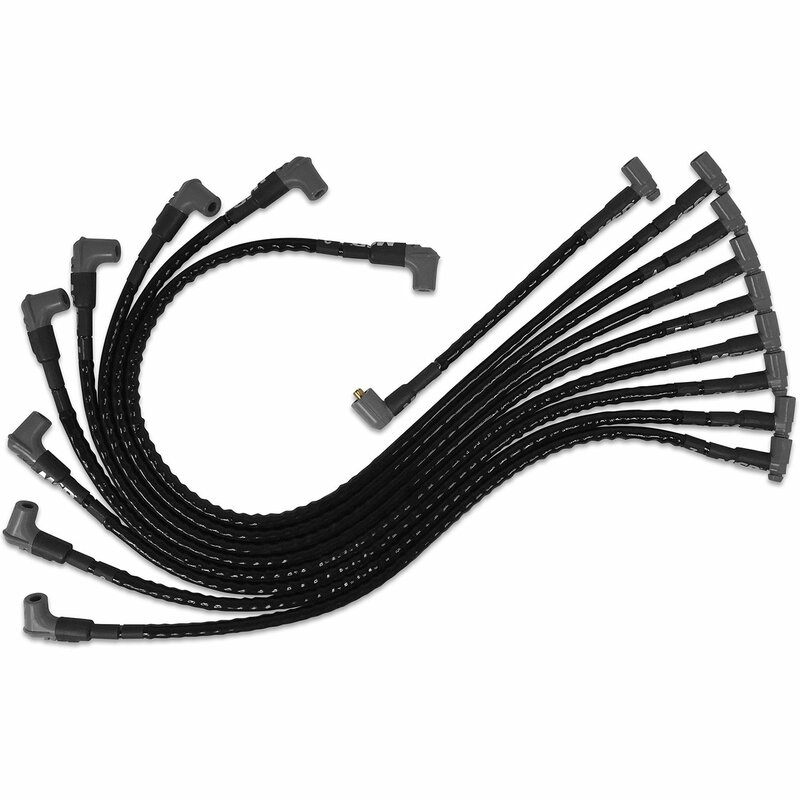 Cap off each end with our Dual Crimp Terminals and you have the best wire available. Equipped with high temp silicone-fiberglass sleeving for the harshest race conditions that protects wires up to 1,000 °F. 8.5mm Super Conductor wires with high temp silicone-fiberglass sleeving. For SBC race engines with under exhaust wires with HEI ends. Includes coil wire for remote mounted coils.